Enrollment application fee ($20.00) and current year membership dues ($80.00) for associate membership in the CIS Body of Certified Professionals. to the address you provide during purchase. 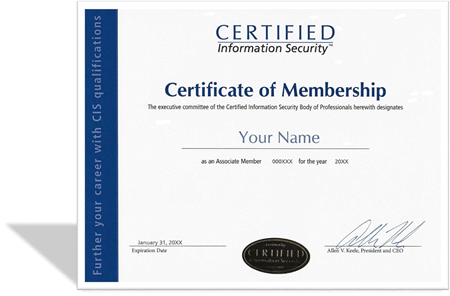 Terms of Service: Purchasing this membership entitles you to participate in the Certified Information Security Body of Certified Professionals as an associate member for the current calendar year, and makes you eligible to pursue any CIS professional certifications for the duration of your membership. If purchased on or prior to September 30 of the current calendar year, your membership will expire on December 31 of the current calendar year, at which point you will have the option to renew and maintain your credentials. If purchased after September 30 of the current calendar year, your membership will expire on December 31 of the following subsequent calendar year from the date of purchase. You have never been convicted of a felony or misdemeanor crime for an offense that calls into question your integrity or judgment of, such as fraud, bribery, corruption, theft, embezzlement, solicitation, etc. You have never been discharged from employment for dishonesty, criminal acts, or any issue that calls into question your integrity or judgment, such as fraud, bribery, corruption, theft, embezzlement, solicitation, etc. You have you never been subject to an adverse civil or administrative judgment for fraud or any issue that calls into question your integrity or judgment, such as fraud, bribery, corruption, theft, embezzlement, solicitation, etc. You have never been disciplined, sanctioned, reprimanded, or subjected to any like action by a professional body of which you were or are a member. You have never had a professional license (or other authority to practice) revoked or suspended. You agree to abide by the CIS Code of Ethics. Membership is a privilege and not a right. Qualifications are established by the Executive Committee, whose decisions are final. You consent to the storage of your personal information in CIS’ offices in the United States, its regional offices, and its local chapters.